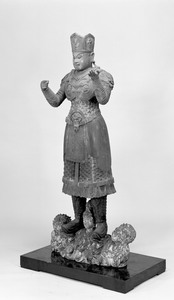 The body was decorated with crown and dressed in a coat-like armor with chained decoration. 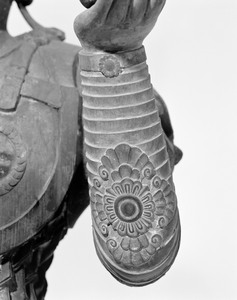 The right arm was covered with shrimp-shaped gauntlet (ebigote). 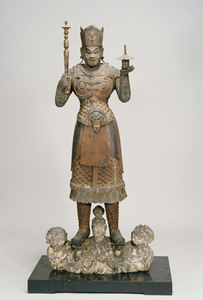 Mounted on the pedestal in the form of goddess (chiten'nyo) hands. 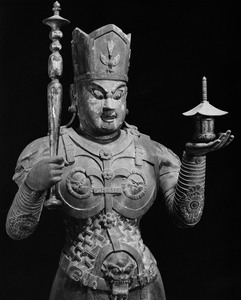 These features were derived from the statue of Tobatsu Bishamonten which came from China to Tō-ji Temple in Kyoto Prefecture. 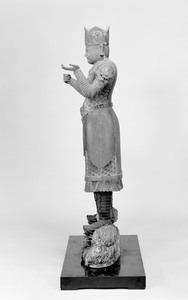 This work was faithfully modeled after the original statue compared to other examples. 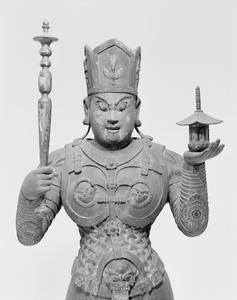 Masterworks from the Nara Buddhist Sculpture Hall at the Nara National Museum. 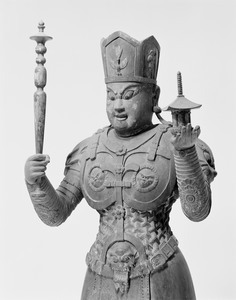 Nara National Museum, 2010, p.139, no.143. 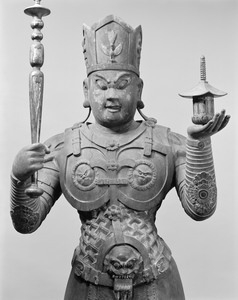 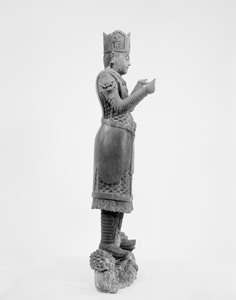 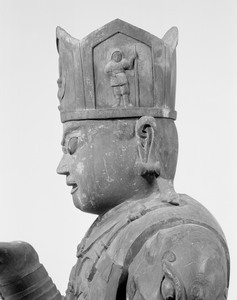 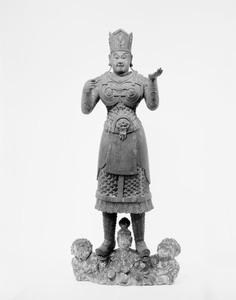 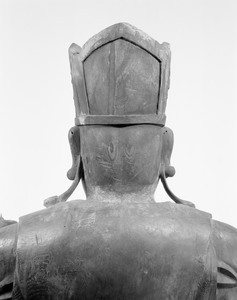 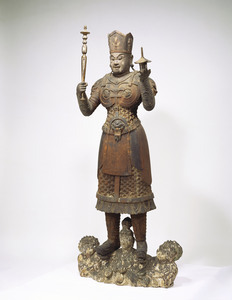 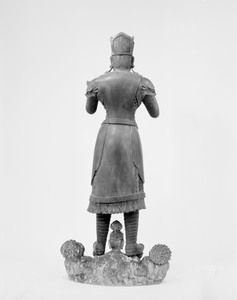 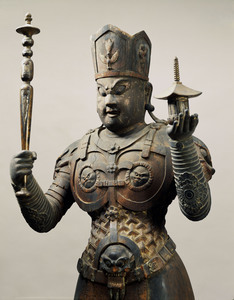 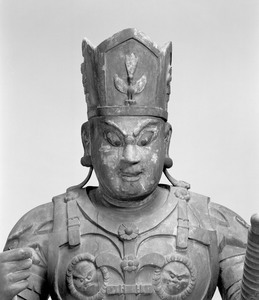 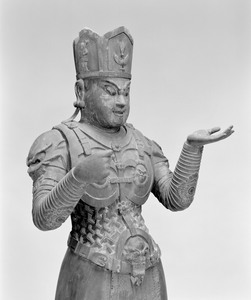 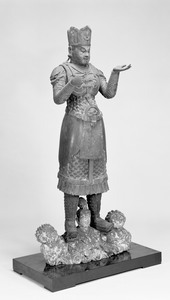 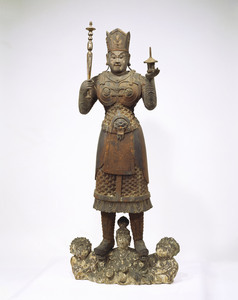 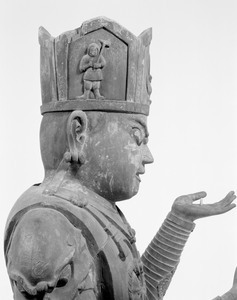 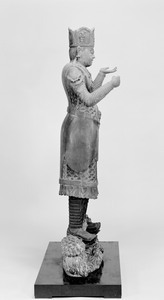 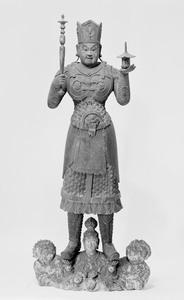 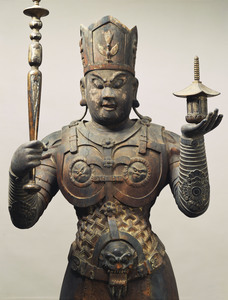 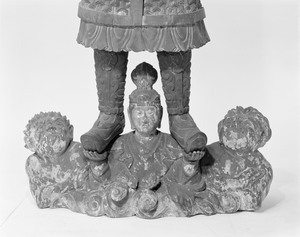 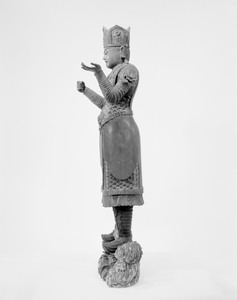 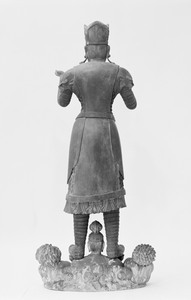 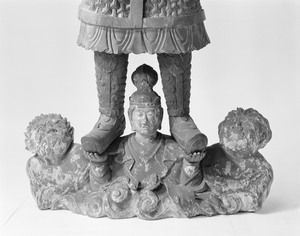 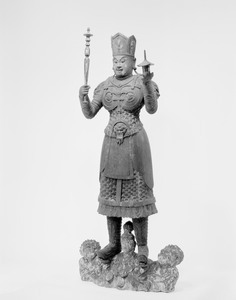 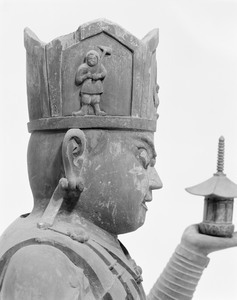 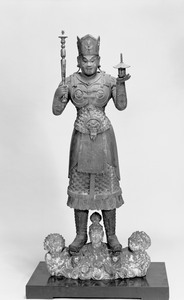 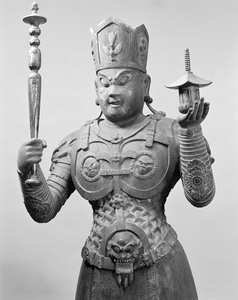 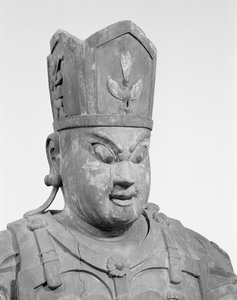 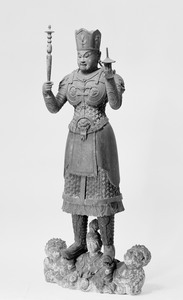 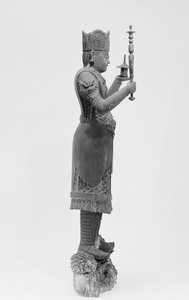 This statue, which is kept in the Nara National Museum, is notable as the most precise copy of the statue of Tobatsu-bishamon-ten (Vaiśravaṇa) in Tō-ji temple, which was made during the Tang dynasty in China and was originally placed on the Rajō-mon Gate in the capital Heian-kyō (today's Kyoto city). 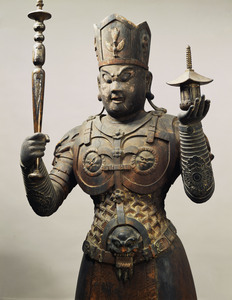 Unlike other copies in Seiryō-ji and Kurama-dera temples, this statue in Nara features many details of the original such as the design of the phoenix on the front side of the crown and human figures with a stick on both sides of the crown, both of which are made in relief carving; other details are the unique armor-coat made of chains, the arm protectors and leg protectors in the shape of lobster-shells, etc. 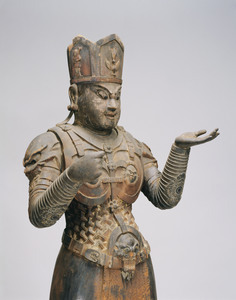 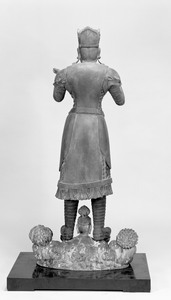 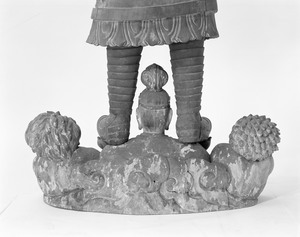 But this statue is standing in a static posture, whereas the original statue is slightly twisting its hips and legs. 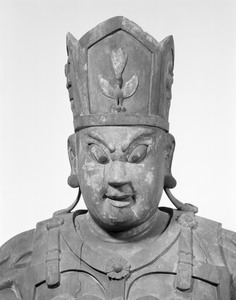 The eye-pupils of this statue are not made with inserted black stones, which gave it a gentler facial look than the one in Tō-ji temple. 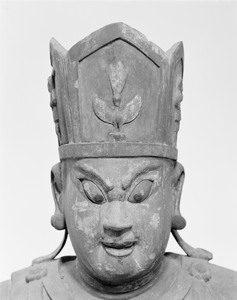 This description style of eyes is in common with the other copy of the same statue in Seiryō-ji temple and is an interesting point in studying these copied statues. 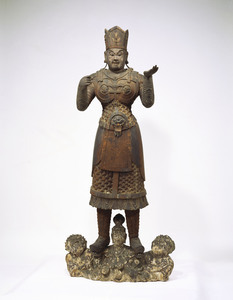 This statue is made in the manner of assembling pieces of hinoki wood (Japanese cypress) and is colored. 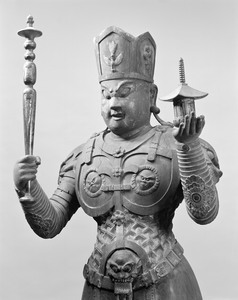 Masterpieces of Nara National Museum. 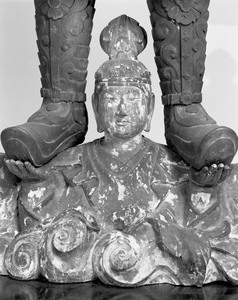 Nara National Museum, 1993, p.19, no.8.